I got to get out fishing a couple of times this weekend, and have been too busy in-between to get up individual reports. So I will break up this report into both days. I also picked up a beautiful custom made 5'6'' lure casting rod yesterday. Its constructed by forum member Bundybear and its an absolute piece of artwork. And thanks to Shimano and Terry at ProTackle it now has a Chronarch sitting on it with 30lb Power Pro. 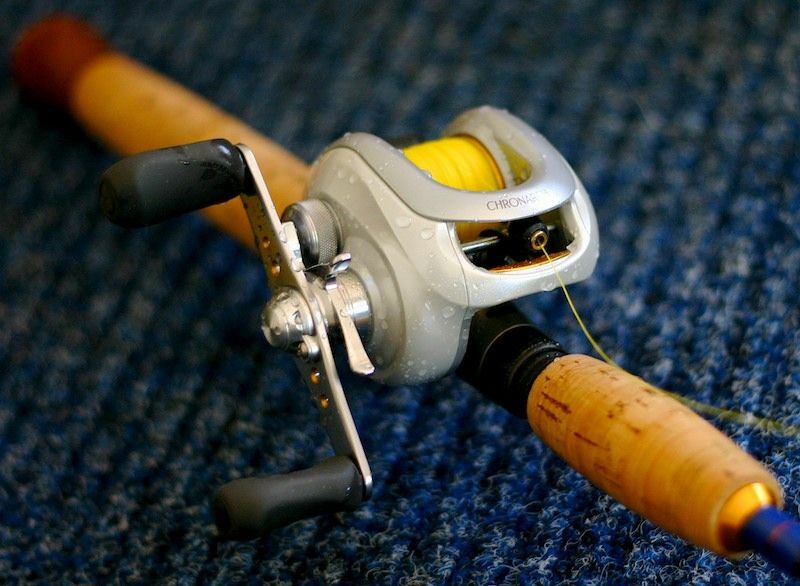 The workmanship on the rod is second to none, and the reel is a smooth as silk. I can't wait to give this baby a real workout! Dave Little and I had been making plans all week to investigate some new waters around the mouth of one of our southern rivers, but flooding of the road into the ramp had as fall back to plan B. 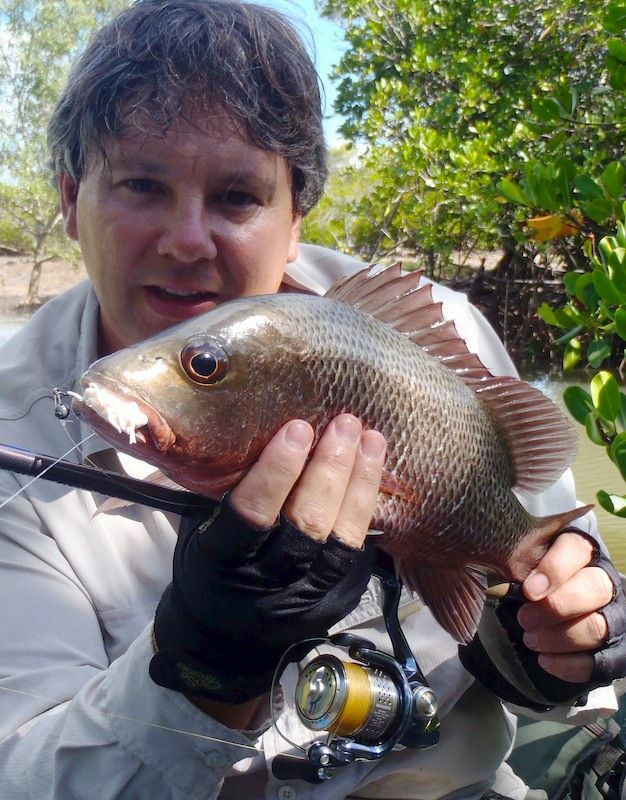 So we ended up putting in at a smaller creek (struggled a bit on the low tide) and fished around all the mouths. With so much fresh still running in the systems we hoped that the incoming tide would bring in clean salt and some hungry fish. 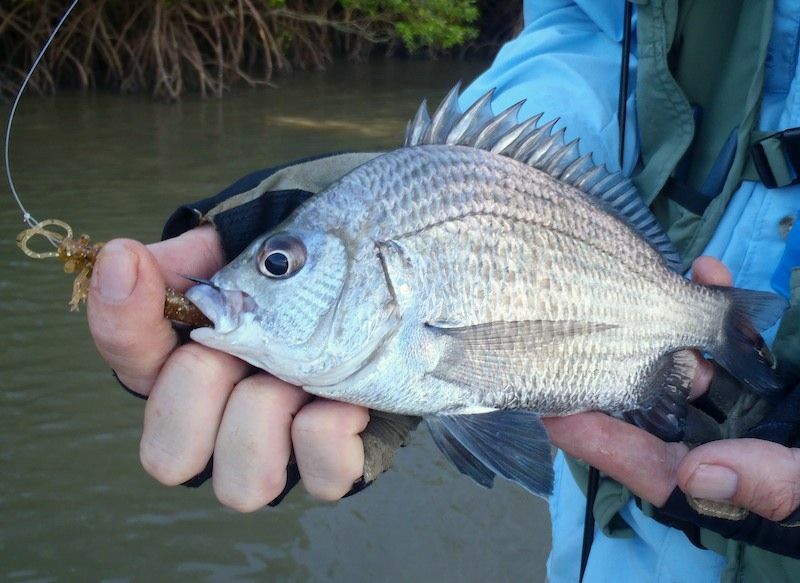 We worked our small soft plastics along the snags and came up with a pair of nice Bream to start the day. A lot of bait was in the system, but not a whole lot of action. It was a long time between strikes. After way too many casts with not even a look in we decided to head into a smaller creek to look for clean water. And not too far up we found what we were looking for, but despite the clearer look, it was very fresh still. Lots of bait around so we gave it a shot. Again there were a large number of empty casts, but eventually something decent hit my 3in prong. It hit hard and tore off from the snags with a flash of silver. Dave is calling 'what is it', and I replied 'well if its a Jack its a bloody good one'. 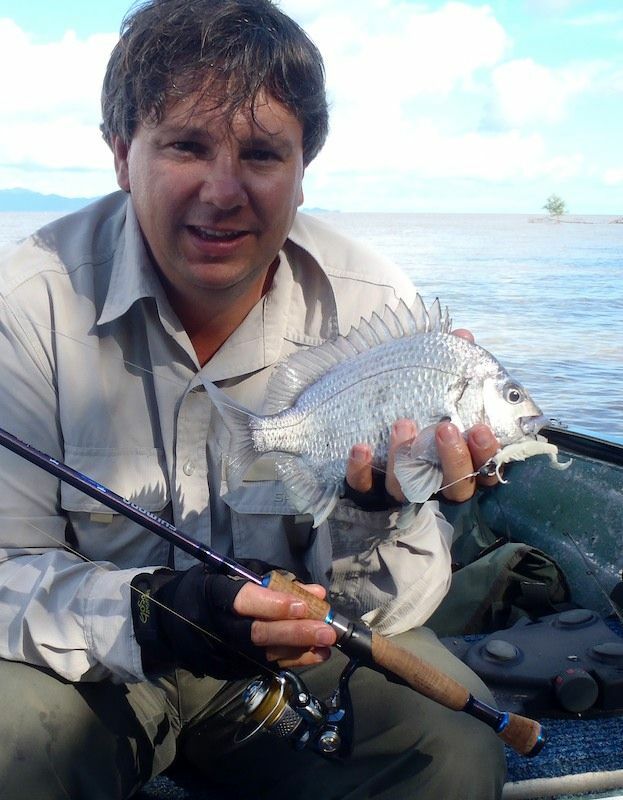 Full pressure on the Stella 1000 and the 8lb Power Pro did its job and pulled the fish out into open water. A couple of lunges from the fish and soon a solid Jack was in the net. At 40cm it was nice to see on a tough day. We kept working around all the creeks in the area for nothing more. As the tide topped out the water did clear, but it was now the middle of the day and the water temp had reached 31.5oC. We were hot and had had enough. With the creeks not firing I decided to take Dad for a drive south to chase some fish in the lagoons and freshwater run off. Our first stop was at a drain running into the top of a local creek. 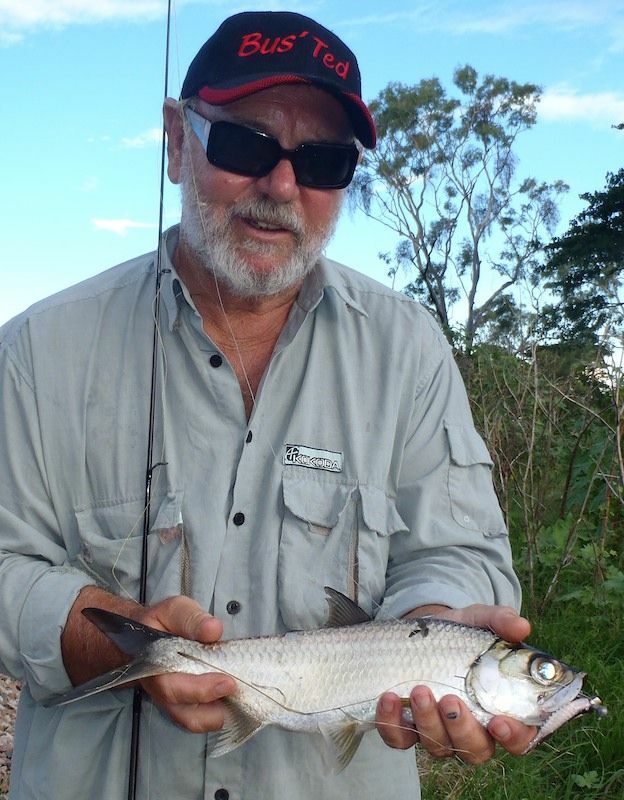 We anticipated some Jacks, but knew there might be some Barra about too. And after releasing 4 small Barra and watching another guy hook and loose one in the 70's we decided to move away and look for something different. 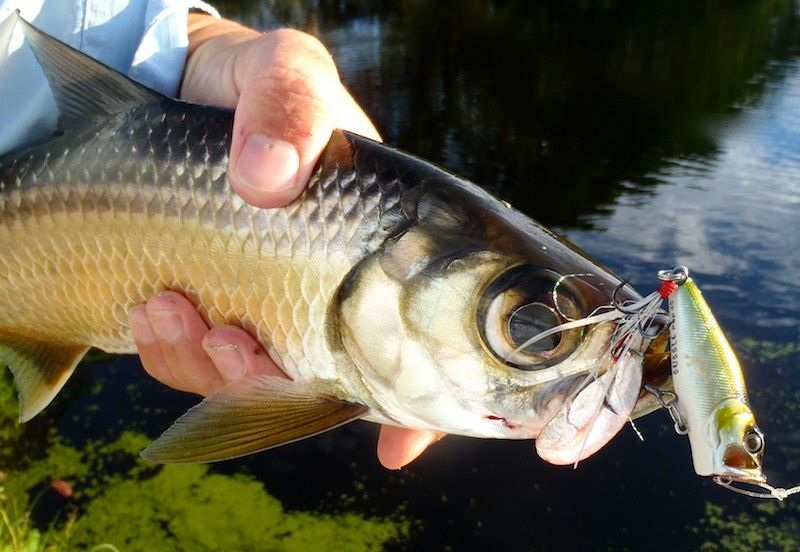 Our second stop was a freshwater lagoon that usually holds some decent Tarpon. And as soon as we pulled up we could see some big fish tailing in the water. Over the next hour we caught and released over a half dozen fish each. The biggest around the 2kg mark, and most just under 1kg. Dad was using a 70mm Squidgie fish and I stuck with the Bubble Pop that I'm addicted to. While the sun was up the Squidgie was doing well, but as the light faded the Popper took over completely. Overall the popper accounted for a similar number of fish, but attracted far more strikes and took the biggest fish of the day.